It was a cold gray day amidst a wet cold month as Danielle, Gabrielle, and I sat out on the curb in front of our house when I noticed tough green daffodil leaves lancing up through the mulch. I pointed it out to Danielle who immediately went in to investigate. This seemingly insignificant discovery did wonders for my mood. Those robust shoots reminded me that the cold and grey would soon give way to warmth and light. They are every bit as reliable as the winter solstice, and maybe a bit more so than a certain rodent with teeth as long as his name. Daffodils, also called narcissus, originated in Southern Europe as well as parts of China, Japan and Morocco. There are about 50 different species that are categorized in twelve groups, based on look. In favorable conditions, (like ours) the bulbs may outlive the person who planted them. These are no delicate tulip bulbs that need to be replanted every few years. Nor do they need much in the way of pest and disease control as they are generally free of both. (Screw you Monsanto.) They are seemingly happy wherever they are plugged into the ground and will obligingly clone themselves by way of growing clusters of bulbs which can be dug up and divided, then stored in a shed for a few years before being distributed to neighbors; as I am wont to do on occasion. They will also propagate in the usual flower fashion of pollination by insect and wind, but the resulting seeds will take a long five years to produce a flower after germination. On many a stroll down the roads of Oysterville, Washington I have noticed daffodils growing amidst the forest. Often looking closer there's evidence of a tumbledown cottage or perhaps only the remains of a foundation, almost fully claimed by the forest. The daffodils that once grew in a flower box or along a picket fence are all that remains of a home. Whenever I see this my imagination erases the tangle of brush and conjures up sepia toned images of a small cottage with a trim lawn and perhaps a tire swing hanging from a thick branch of a maple tree in the front yard. Perhaps some children playing while the adults relax on a rocker on the front porch or standing at the gate while visiting with some passersby. What were we talking about again? Oh yes, daffodils. Daffodils have been one of my favorite flowers for as long as I can remember. I've always been an outdoor kind of girl so those short soggy days spent mostly indoors are long ones for me. I have vivid memories of being outside in shorts and tee-shirt (in kid protest of the enduring cold) while climbing our maple tree and beneath the tree in a patch of hard dirt grew the loveliest patch of daffodils, which I'd lay on a low hanging branch to admire. It still makes me smile. I've always imagined their beauty to be a gift to others, not selfish vanity like the Narcissus of Greek mythology. Daffodils, being so common and nearly weed-like in robustness, I assumed my particular fondness for this flower was rare. However, I couldn't have been more wrong. 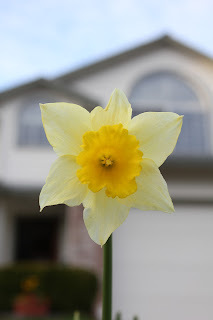 Since thinking about writing this article, I've noticed each of my neighbors remarking on the daffodil leaves and overheard many a conversation of strangers whose subject was the very thing. It seems as though the daffodils hold the same promise for everyone. The Chinese believe that if the daffodils bloom before the Chinese New Year there will be extra wealth and good fortune and although I couldn't find verification of this for 2012 on the vastness of that which is Google, I do believe that they did, and that the good luck transcends the borders of China. Danielle observed that I made a mess. "Yes, I stepped on the cat's bowl, but don't worry I'll clean it up after lunch," I replied. Danielle got up, magnanimously grabbed the broom and said, "I'll do it Mama!" Dum-dum-da-dum! Her untamed strokes of the broom sent kibble floating all over the floor. After corralling about half of it (and some other dirt) she took the dustpan and managed to sweep some up, while sending more around the floor. She then whipped open the cupboard door and tried to dump it in the garbage by shaking it, which instead shot it all over under the sink. Miraculously not one kibble landed in the trash. It's like it had a force field over the top of the can. At this point, inconspicuous intervention is necessary. I put the baby in the playpen and pull out the garbage can and start cleaning up under the sink. She does a bit more sweeping and drops a few kibbles in the can this time. (Yay!) She then dropped the broom and dustpan in the middle of the floor. Whack! Now that the floor cleaning complete she moves on to the next task. She pulled out the big bag of cat food and refilled Loki's bowl. Then she laid on the cat food bag to admire her hard work. "I cleaned up your mess Mama, wasn't that nice of me?" she said. I said, "Baby, I love you. Thank you for cleaning up my mess." She skipped away. Gabi started to fuss in the playpen so I soothed her, then went back into the kitchen and swept the floor, put the broom and dustpan away, put the garbage can away, and put the cat food bag back in the cupboard. I have a wonderful kid. She tried with all her four-year-old skill and zest to help me clean up a mistake I made, just because she loves me. Although, next time I think I'll just clean it up right away and give her a big hug instead. 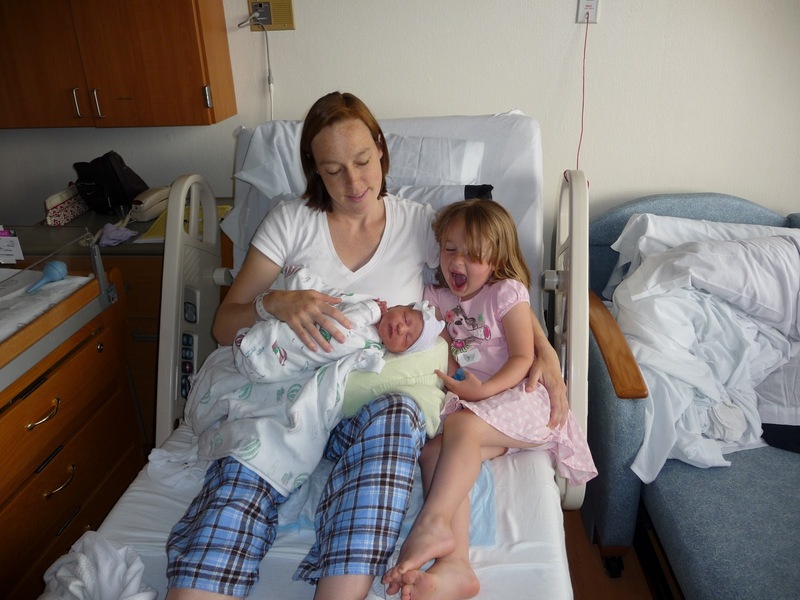 I wasn't one of those moms who just couldn't wait to "get the baby out." 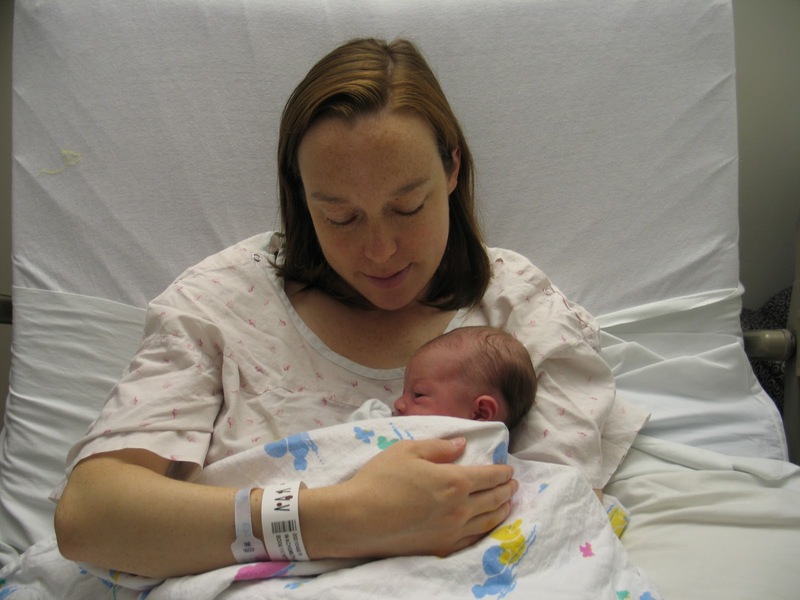 While I was pregnant I was well aware of how good I had it, relatively speaking. All I had to do to be the perfect mom was take my vitamins, eat well, rest and get a breath of fresh air now and again. That was it. However, as my time approached I felt increasingly restless. Here I was nearly forty pounds heavier than usual and unable to sit still, as I buzzed around doing a bit of this and a bit of that, then this again, and then that again. "Amy, just sit down!" I'd hear. I was generally in good spirits and unafraid for the most part. 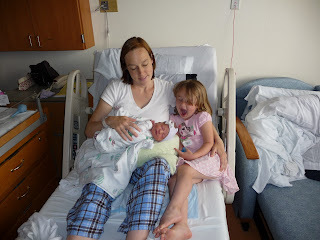 Towards the end of my first pregnancy, I was getting anxious about how much pain would be involved. Then during a phone conversation my friend Carmen said, "Amy, it's just a day. You just have to do one day and it's over and you'll have your baby." Quantifying the duration as she did, erased my anxiety. I can tolerate anything for a just a day. My first experience ended up lasting two days; but the spirit of the advice is that it's there, and then gone. And it was, and was. I also had great faith in my obstetrician and St. Vincent's hospital. So long as I could just get there, (and stay there—they do love to send 1st time mommies home) I knew that the baby and I were in good hands. I have never felt like as much like a VIP as I have during my two deliveries there. The nurses are compassionate and attentive and the doctors are amazing. I thought that if I was ever to work in health care, I'd want to be involved in this side of things. Everyone just seemed to be happy. It must be uplifting working with life coming into the world instead of the majority of medicine which deals with life going out of the world; the yang to the birthing yin. If the birthing process were a musical composition played by a symphony, it would start slow and quiet, staying that way long enough to make you wonder if you're really hearing anything. Then just as doubts would surface, here come the bass, brass, then the strings. Then cymbals and tympani come in and the music starts to crescendo, crescendo, then, then, then.... nothing. Back to the quiet music, layered under with intensity that wasn't there before. Sweat is pouring down the conductor at this point as the lights burn into her shoulders. She frantically motions for the brass, strings, percussion, which join in turn then crescendo, crescendo, crescendo the pressure building, she loses a button, the member of the symphony are showing obvious signs of great fatigue, crescendo, hold, hold, HOLD!! then cut. The conductor collapses in a heap as a baby's tiny cry pierces the stunned quiet of the auditorium. All this great symphonic composition and as my angel is being brought to me and laid on my chest, do I spout the poetry with meter that keeps time with the pounding of our united hearts? What sonnets burst forth as she goes from crying to peaceful upon contact with the skin of her mother? My fingers explore her features, my eyes drink her in, I absorb her through my breath and touch of her skin. What words come forth to articulate this eruption of emotion??? "Hi, Baby!" After Gabrielle's birth, my very next thought was, "I'm not pregnant anymore. I'm never going to be pregnant again." It is a bitter sweet phase of life to see come to a close, as it will be with the baby phase, then the toddler phase. I'm sure I'll even miss the teen years when they come and go. So with the conclusion of this article I can put this phase in a pretty box, tie a ribbon around it and tuck it away in the annals of my mind and get myself ready for all the fun of toddlerhood, bigkiddome and the challenges of sibling rivalry.